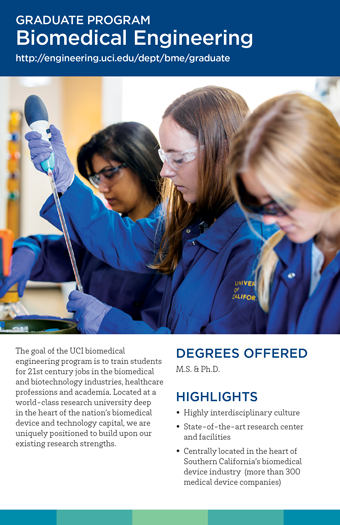 The Biomedical Engineering faculty have special interest and expertise in four thrust areas: Biophotonics, Biomedical Micro/Nanoscale Systems, Bioimaging & Computation, and Molecular & Cellular Engineering. Biophotonics faculty are interested in photomedicine, laser microscopy, optical coherence tomography, medical imaging, and phototherapy. Biomedical Micro/Nanoscale Systems faculty are interested in molecular engineering, polymer chemistry, molecular motors, design and fabrication of microelectromechanical systems (MEMS), integrated microsystems to study intercellular signaling, and single molecule studies of protein dynamics. Biomedical Computation faculty are interested in computational biology, biomedical signal and image processing, medical imaging, computational methods in protein engineering, and data mining. The Department offers the M.S. and Ph.D. degrees in Biomedical Engineering.